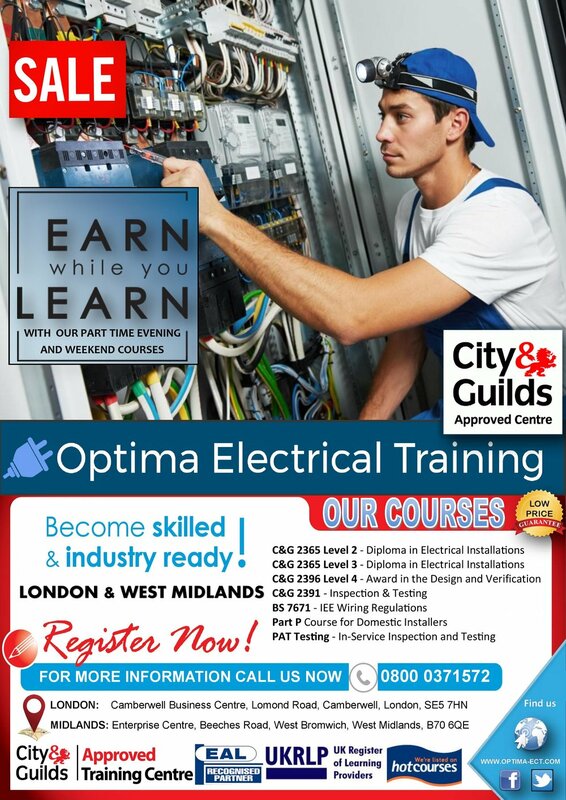 Optima Electrical Training is the leading approved centre for providing City & Guilds qualifications and one of the only EAL centres in the Midlands. With sites located in The Midlands and Central London, we have helped many learners achieve their training goals. We offer a wide range of City & Guilds and EAL accredited electrical courses that have been designed so that they can be tailored to suit your personal needs. It is a now legal requirement for anyone who is to complete a range of electrical work in a domestic dwelling be adequately qualified. These courses have been designed to enable you to prove that you understand and can comply with the Part P building regulations. We deliver this qualification in 3 course options depending on your level of experience. This course will provide electricians with a solid understanding of this form of environmentally friendly technology as well as the practical 'hands on' experience of installing and maintaining real solar PV panels. This course consists of 2 units. The first will provide you with a basic overview of renewable energy technology, the second will enable you to install and maintain solar PV systems. C&G 2391 (prev. 2394/2395) This course is designed to help improve your understanding of the legal requirements, the theoretical and practical principles for the initial verification and certification of an electrical installation. The law places a responsibility on all employers to ensure that the electrical equipment to be used by their staff and the public, should be fit for purpose and safe for use. This course is designed for those who are performing the periodic inspection, testing and recording on the condition of electrical (current) using specific equipment. To build on your understanding and knowledge gained from the level 2 course. This programme covers all of the necessary elements to further develop your skills and theoretical knowledge and understanding of advanced electrical science, inspection and testing, fault finding and rectification and electrical design. We have devised packages that allow us to combine a number of our short courses that we feel compliment each other and allow you to progress on the career path you desire. These packages are designed not only to save time but more beneficially to you, to save you money! We will endeavor to accommodate requests for personalised packages. With over 45 years in the industry and as a training provider, we have the experience, the know how, the reputation and the staff that has helped countless people like yourselves achieve their full potential, thus making us one of the midlands leading training providers. Our main aim is to help and support you along your journey in achieving your goals. There are many reasons why you should choose to complete your training with us, we have outlined a few factors below which our students have told us is the reason they decided to train with us. We do not pretend to be a jack of all trades. We only offer a wide range of City and Guilds and EAL courses in the field we have the knowledge and experience in. We are the electrical training specialists. We have built up a solid reputation over the years. The vast majority of our clients in the past have opted to complete their further training with us and stating that 'word of mouth' was the initial reason why they spoke to us. They have then gone on to tell others about our services, which is testament to our professionalism, quality and friendly delivery of our courses. We are a 'truly' flexible training provider. Due to our size and the staff we have, we can tailor our wide range of courses to suit your individual needs. We offer our services throughout the week, evenings and weekends and our course dates can be arranged to suit you. Just ask. As we are an independent training provider and intend to stay that way, lower overheads and other expenses allow us the freedom to offer very competitive prices without compromising on the quality of service we deliver. Our pass rate is over 98% across the board and again that is testament to the quality of our staff. With sites in London, the South East and The West Midlands our locations makes us easily accessible for learners nationwide. We also provide on-site parking (excluding London) and are located nearby bus services, tram and rail links. Most colleges and other training providers tend to herd their service users in large groups because bums on seats means more turnover and profit for them. We believe that smaller groups offer a more personalised, relaxed and friendly service to our users which is beneficial to both yourself and us. The more you get out of our courses, not only will you become better at the services you provide but if you decide to undertake further training courses to expand your knowledge or qualifications, the more likely you are to do them with us. Achieving great results in less time. Smaller group sizes enables us to maximise your potential which in most cases allows you to complete the courses in less time when compared to colleges or other training providers. Our professional and friendly staff are available to book one to one sessions throughout the year whether your on one of our courses or completing your studies elsewhere and need that extra tuition. We offer both theoretical and practical tuition sessions. Having passed BS7671 17th edition of the regs last year and having completed my inspection and testing with Optima Electrical Training, I would just like to thank you for the way you made the courses so relaxed and easy to comprehend. As a self-employed electrician it was really useful to be able to tell you when it was convenient for me to do the course rather than to have to plan my work around the ridged times at the local colleges. I will certainly be contacting you for any future courses I need to attend and will have no hesitation in recommending Principal Electrical Training to others. Les Rose is an extremely welcoming person. He is easy to communicate with and has an ability to explain his teaching easily. I found working in his class, with a small group of people more beneficial to me as any help that was received by me. Les had more time to help me and those in his class, his time was so divided and limited and as with larger groups I have been in. Overall, I will definitely be recommending Les to friends and family. I’ve really enjoyed this course (2392) and Les Rose has helped me to understand the inspection and testing so much more. I recommend this course to anybody looking to take an inspection and testing course. It will help you and having a tutor like Les makes it easier to ask questions. Plus having a small group, it’s more like one to one, asking questions and finding answers is not a problem. I’d like to start with a big thank you from all at A B Electrical. Attending courses is always a daunting thing for us electricians, having to go back to school. But thanks to the friendly relaxed attitude of all concerned at Principal Electrical Training, we were all put at ease, yet still maintaining a very professional and comprehensive level of training. We have already highly recommended you to fellow electrical contractors and will continue to do so in the future. Once again I would like to thank Les Rose all at Principal Electrical Training for your continued support. Having passed BS7671 17th edition of the regs last year and having completed my inspection and testing with Principal Electrical Training, I would just like to thank you for the way you made the courses so relaxed and easy to comprehend. Please complete the form below if you would like information or advice on our course options, fees or payment plans and one of our dedicated and knowledgeable team will be happy to contact you to discuss your enquiry with you further. By completing the form you also qualify for a 10% discount off your next course booked with us. Alternatively, if you wish to contact us directly, please call us on 0207 117 2937 or 0800 037 1572 (Freephone) between 9:00 – 18:00 Monday – Saturday and mention 10% off promo and we will honour the online discount.